Something different for the drivers. 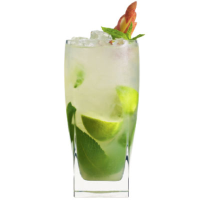 Squeeze the lime into a tall glass and muddle with the mint leaves and sugar. Add crushed ice to fill the glass just over half full. Pour over the apple juice and stir lightly. Add more ice to fill the glass and top with soda water. Garnish with a slice of apple. Try with Waitrose Apple, Raspberry and Elderflower Juice.